We’d love your help. Let us know what’s wrong with this preview of The Brave Learner by Julie Bogart. To ask other readers questions about The Brave Learner, please sign up. I wanted to love this book. I have a MS in Applied Psych, focused on educational psychology. I'm a homeschooling mom. We practice delight-directed learning. The cover art is adorable. I'm clearly sold on the premise of this book! Unfortunately, Bogart just doesn't present the information in a way that connects with me. She gives an example of a commonly accepted idea from ed psych, say, scaffolding, without identifying it as such at the time - but then goes on to include the term "scaffolding" i I wanted to love this book. I have a MS in Applied Psych, focused on educational psychology. I'm a homeschooling mom. We practice delight-directed learning. The cover art is adorable. I'm clearly sold on the premise of this book! Unfortunately, Bogart just doesn't present the information in a way that connects with me. She gives an example of a commonly accepted idea from ed psych, say, scaffolding, without identifying it as such at the time - but then goes on to include the term "scaffolding" in a list a chapter or two later without ever connecting it to the previous example. The whole book feels similarly disjointed, and a quick glance at her "notes" section suggests a lot of surface-level research with no real depth or breadth of understanding (and perhaps a bit of cherry picking when it comes to her sources). I wasn't expecting the book to read like a thesis, but I did expect her to support her ideas more fully. I got the sense that she wrote the book based on her experience as a homeschooling parent, then backtracked to add in the "research" support at the very end. It feels disingenuous, and frankly I was annoyed by the constant slips into self-promotion present throughout the book. I'm sure Bogart is a very nice lady, but the tone of this book was unappealing. I debated whether I should keep reading after she flippantly referred to the reader as "cupcake," and the bit about mimosas being mandatory when brunching with other moms struck me as either a) a cry for help or b) a failed attempt at humor/relevance. Can we stop with the mommy drinking culture shtick already? I gave this one 2 stars because it could be truly useful as encouragement for the mom who has never studied motivation and learning theory on her own, and who needs a little push to relax into a more natural style of home-based education. I have enjoyed listening to Julia Bogart's youtube/podcast. I have heard so many positive reviews about the Brave Writer curriculum that I have considered using it (but have not). I knew from listening to her before that she takes a neutral stand in her curriculum on religion/theology. Which I don't have a problem with as it is teaching writing not the Bible. So going into reading this book I knew it would not be from a Christian worldview. I believe she claims to be a Christian. There are some I have enjoyed listening to Julia Bogart's youtube/podcast. I have heard so many positive reviews about the Brave Writer curriculum that I have considered using it (but have not). I knew from listening to her before that she takes a neutral stand in her curriculum on religion/theology. Which I don't have a problem with as it is teaching writing not the Bible. So going into reading this book I knew it would not be from a Christian worldview. I believe she claims to be a Christian. Unless you are a child centered home,child led educator, and follow "gentle" parenting some of this will will not fly for you. Probably better fitted for unschoolers, relaxed or eclectic, and secular homeschoolers. I feel that is book is filled with a lot of propaganda that most homeschoolers try to to avoid (why they don't put their children in public school) especially if you're a Christian. While my child means the world to me, we are not a child centered home. Our home is a family home which considers all members not just the children. Where we work on our marriage- which will be longer than the amount of time my children are in my home. (Maybe if Julia and her husband had not just focused on their children they would not be divorced?) And while I do think what whatever philosophy of education you practice there will be times that you do follow your child's lead and learn about what they are interested in. But not to the point that I would just follow that and not complete core subjects or allow my child to decided how much school she feels like doing. As the teacher and parent we are to be leaders and help/guide them in their education and life. There are a few thing that had me shaking my head. Multiple times she degrades rote memorization. And while I know public schools do none of that anymore (or even when I was in school) most homeschoolers do especially classical and CM. Its not that you have them memorize and not understand as she implies. You have them memorize so that down the road they have knowledge to draw upon with understanding. She made the point that we live in a digital age- they have calculators and the internet they don't need to have things memorized! They just need skills to analyze the information. Really she is promoting Google IQ. And really this is a problem, public schooled adults even today and the children coming out don't know a whole lot, but yeah we have google... This one reason our culture today is falling apart we don't know our history, grammar, or basic math. She really promotes the home being set up for the kids..you know they didn't get to pick their parents or where they live or the things they have as you do being an adult so forget what you have worked for or what you have it should all be for your children. Don't get the furniture you want or have things look nice. Examples she gives- if you get a new table you should dent it yourself so you don't get upset when your child does. And get a couch that can take a beating. How about instead we teach our children to treat belongings with care and respect? She say children should just be allowed to be children. I agree they should enjoy childhood but I'm not raising my child to be a child, she will be an adult one day and the habits, morals and personality she has now will be who she is as an adult. She promotes children to not be required do chores-as there is enough time as an adult to learn these skills when they need them. If you can afford to she says to pay for cleaning services. If you can't you can do it as a family or just do what you can and leave the rest...until it bothers you. Ask your kids if they want to help but don't demand it. Maybe this is why there are young adults today that need "Adulting" classes, because their parents didn't teach them basic life skills! She also really promotes allowing your child to play video games. If your child want to experiment with cuss words allow them to or rock music or whatever they fancy... Just don't be a controlling parent! She promotes "gentle" parenting over "authoritative" parenting. Trying to suggest parenting in a homeschooling book is hard because you parent based on your beliefs- theology will play a big role in your parenting style kinda hard to address from a neutral standing point. The positive take away from this book building a good relationship with your child. Helping them to have creative outlets and encouraging them in learning new things and finding interest/hobbies. Dirty bathrooms ,hiring cleaning staff ? I really dislike the chapter on not cleaning or hiring cleaning staff .saying teenagers need to be in the world not the kitchen,saying housework is not rocket science .it all sounded so belittling.cooking is a skill as worthy as any other .not cleaning the kids bathroom ,but if they are filthy cleaning it every quarter .ugh not for this family .you can home school and all chip in with t h e care of the home ,children's learning should be vast enough to enc Dirty bathrooms ,hiring cleaning staff ? I'm giving this one 5 stars only because I can't give it 4.5. And the the things I didn't like may be the things that help another mom out there so I'll leave it at 5. Julie gives such practical no nonsense wisdom and advise. She helps you let go of the non-essentials and helps you get your vision and focus back in track. The end of the book was invaluable in that she becomes like a homeschool therapist and helps you get to the root of maybe what's going wrong in your homeschool and how you can I'm giving this one 5 stars only because I can't give it 4.5. And the the things I didn't like may be the things that help another mom out there so I'll leave it at 5. Julie gives such practical no nonsense wisdom and advise. She helps you let go of the non-essentials and helps you get your vision and focus back in track. The end of the book was invaluable in that she becomes like a homeschool therapist and helps you get to the root of maybe what's going wrong in your homeschool and how you can fix it. Or in some cases be ok with it not being perfect. I've never read such brutal honestly in any other homeschool book. The section about self-care for the homeschool mom is so important. I wish I had read this years ago. My only problems with the book was that I was a little overwhelmed at the beginning when she talked about setting up a creative space and stocking it with all these craft and art supplies and letting the kids makes a mess. 😨 Sorry. Totally not doing that. I also wasn't sure how I felt about her leniency with online gaming for kids. I totally get her point on that one in one sense and I'm glad it worked for her son in that he became a self taught computer programmer. However there are kids out there that are totally addicted and become unmotivated to do anything else. Lastly, the part about housekeeping didn't really help me. I can't afford a housekeeper like she suggested and I'm not going to allow my kids to free load and not do chores either just so they can focus on their studies or interests. We all live in this house together. You wouldn't expect your college roommate to do all the cleaning for you. I enjoyed Julie’s slew of practical suggestions. I’m not sure I, or any one person, could put them all into practice. But I think that’s the point. Rather than sticking to just one theory of education, drop the guilt, pay attention to your kids, and do what works for your family. This book was hard for me to get through. At first, I was excited about the new ideas. Then, as I got into it, I realized that what she was suggesting was so completely different from what I normally do. Changing to fit this model would be a lot of work, and would it be worth it? Why fix what ain't broke? But we are broken. I am broken. Changes need to be made. The book made me feel guilty. And hopeless. And discouraged. I almost didn't finish. And then, I kept reading. It's This book. This book! And then, I kept reading. It's not even a model, per se, but an invitation to reevaluate. It's ways and reminders to live your truth, both personally and parentally (I just made that word up). What is my truth? I guess that's the next step. I think different homeschooling parents will get different ideas and advice from this book, but for me it was five stars because her ideas are already helping to breathe FRESH life into our homeschool days! Did I agree with everything? No. Being ok with kids not cleaning until they’re adults? Ummm...no. But I loved her ways of connecting to a child, learning WITH them, and collaborating to make learning fun. The Brave Learner is an excellent book! Julie not only gives a compelling vision of how parents can support learning at home but practical advice that one can implement right away. I had a hard time putting this book down, finishing it in three days. However, I've already begun re-reading it to glean specific ideas for implementation. Thank you, Julie, for writing such a treasure! Started out great, but fell flat for me pretty quickly. This book is truly wonderful but also a bit overwhelming in the sense that it makes you want to overhaul a lot and introduce all her wonderful ideas - but she encourages you to try one thing a month, to take it slow. I am a longtime fan of Julie and her podcasts and "Gracious Space" books, and this book condenses a lot of her wonderful advice about incorporating surprise, risk, mystery, adventure, and curiosity in your homeschool. Julie knows that the best education takes place when parents and This book is truly wonderful but also a bit overwhelming in the sense that it makes you want to overhaul a lot and introduce all her wonderful ideas - but she encourages you to try one thing a month, to take it slow. I am a longtime fan of Julie and her podcasts and "Gracious Space" books, and this book condenses a lot of her wonderful advice about incorporating surprise, risk, mystery, adventure, and curiosity in your homeschool. Julie knows that the best education takes place when parents and kids are connected, and when parents listen to their children when there are things that just aren't working. Whether you've homeschooled for 2 years or 20, whether your kids are in public school or private, whether you work outside the home or not, this is an invaluable resource for bringing connection, happiness, and warmth to your family. Julie's blend of humor, inspiration, and practical ideas apply to all parents, all styles, all beliefs, all backgrounds! I plan to re-read every year on principle and every time I face a moment of doubt or crisis. Julie Bogart’s philosophy that parent connection is more important than academic instruction is the greatest piece of homeschool advice I have ever received. It makes such a difference to know that. This book is more encouragement. I wish it would have gone into more depth about homeschooling through tricky situations, but I love the emphasis that learning happens everywhere. I enjoy her relaxed, forgiving, and flexible approach to home education. This book is everything I know deep in my heart, but forget to keep in my brain to apply daily. Julie offers wisdom and deep encouragement for the learning journey each of us is on. Will be a quarterly read for me. Literally EVERYTHING I want in a parenting book- reassurance & validation, tons of practical tips, sweet stories, philosophical discussion, and just all-around wisdom about parenting beyond the system— all packed to the brim with enchantment. I would recommend this to absolutely everyone. I thought this had a number of good points to make. Specifically the reminder to bring enchantment back into learning. Also the concept of doing Classical learning in the fall, unit studies in the winter, and nature/outdoors in the spring was freeing. We don't have to pick one style and do it all year. I don’t know when or if I’ve read a nonfiction book that has resonated with me as much as this one did. I’m in the throes of an awesome book hangover now. Excuse me while I try to figure my thoughts out, possibly cry, and copy the entire book into my commonplace journal. Highly recommend. I was excited to read this and I really wanted to like it more than I did! I think that if she had written of tales from her homeschooling experience and let me pick out the philosophies that stood out to me I would have really enjoyed it more. It felt repetitive or just drawn out too much maybe? (mentioning something and then in the next chapter spelling it out) I did like the quotes she chose and they have led to a reading list for me! From hearing Julie on podcasts and reflecting on the readi I was excited to read this and I really wanted to like it more than I did! I think that if she had written of tales from her homeschooling experience and let me pick out the philosophies that stood out to me I would have really enjoyed it more. It felt repetitive or just drawn out too much maybe? (mentioning something and then in the next chapter spelling it out) I did like the quotes she chose and they have led to a reading list for me! One of the best books on homeschooling I've read. I liked that it didn't fall rigidly into any of the schools of thought of homeschooling. Didn't agree with her on her views about housekeeping or lack thereof, but everything else was palatable. Julie is my homeschooling guru! Yes, a lot of her stories and ideas have been shared before on her podcast and other blog writings, but it was great to have it all in one place. I especially enjoyed the audiobook version to hear her speak in her own voice. A must read for any homeschooling parent! This book was far too disorganized and scattered to be helpful to me, which is a shame as there are a few sections in it that are gold. I was eager to read this, even preordering the book, but it surprisingly left me feeling flat. It’s not a bad book, it’s just not for me. It’s too “parent being whimsical” to work for this type A parent of 3 kids. There are many that will love it, but it just isn’t for me for the same reasons the “bravewriter lifestyle” isn’t. I wanted to give the book a shot, so I did. Alas, not my favorite. This book had lots of good ideas but it is just TOO much for me to think about right now. I need to simplify my thinking about homeschool, not find something new. I also feel that most of these ideas allpy after your child is a fluent reader. Not a book for the younger years. This book stands out for being filled with practical ideas on how to apply what she writes about, and also how to connect with our kids and put relationships first. It is a parenting b This is such a wonderful, encouraging, practical book that deserves a place in everyone's home. Julie writes so beautifully about how we can make education enchanting and create magical learning environments for our children. And best of all - none of these ideas require a huge investment of time, money, or energy! Julie Bogart is the popular voice of common sense and compassion for home educators. Her online coaching community, The Homeschool Alliance, her podcast A Brave Writer's Life in Brief, and her YouTube channel are lifelines for tens of thousands of weary homeschoolers all over the world. Julie’s the creator of the award-winning, innovative online writing program called Brave Writer and the fast-grow Julie Bogart is the popular voice of common sense and compassion for home educators. Her online coaching community, The Homeschool Alliance, her podcast A Brave Writer's Life in Brief, and her YouTube channel are lifelines for tens of thousands of weary homeschoolers all over the world. 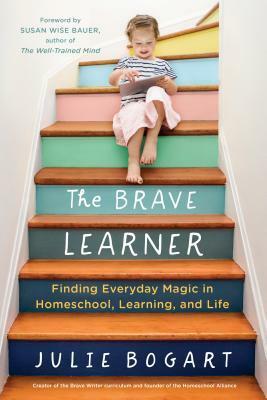 Her newest book, The Brave Learner tackles the conundrum of parents who want their children to have academic success, and children who want to be happy. Can’t we get these two desires together: learning that develops skill and creates joy? Creating a love of learning in your family is as easy as lighting a fire. You just need a book of matches. The Brave Learner is that book.